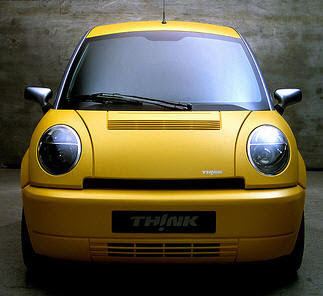 Gearing up for its big announcement on Wednesday 5 March at the Geneva show, Norwegian electric car maker Think has created a blog. There's not much to see at the moment, aside from pictures of a yellow Think City 2-seater on its recent visit to London - for some reason adorned with signatures. Some people think that Think's big announcement will be a tie-up with General Motors, and that the promised Think four-door will be built on GM's E-Flex platform. That's certainly possible. But we prefer to wait and see. There's no shortage of car companies keen to be seen to be green.